In yet another epic week , David Shiffman brought Shark Week to Real Scientists, sparking massive discussions on everything from peer review to sustainable fishing, shark conservation and advocacy. Sharks a subject dear to the hearts of all Australians, our summers are punctuated by stories of shark attacks and sightings from Harbor to isolated northern beaches. Feared, venerated, and hunted for for food, sharks are some of the most ancient and astonishing of all sea creatures. Starting off on Sunday morning Aussie EST, David introduced himself and his work as a student and conservationist (Storify Part 1). 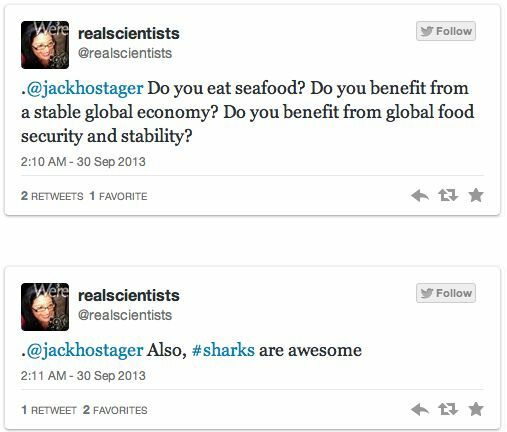 So, why sharks, asked US midwesterner @jackhostager, why should I care about them? 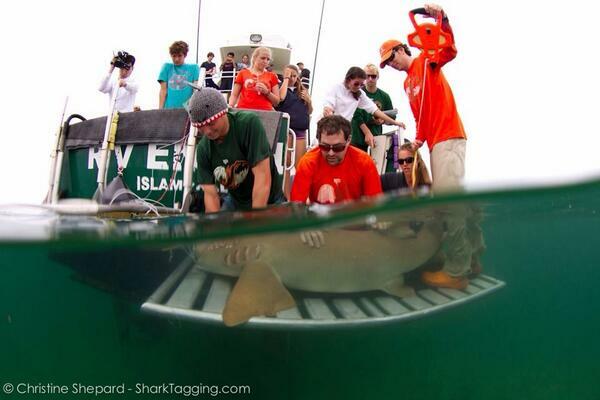 Throughout the week David highlighted the relevance and connectedness of environment, social sciences and hard science with his work (Part 2 of Storify here), the importance of predators in all kinds of ecosystems, and how they track and study sharks. David showed us how disciplines and methods that seemed purely scientific were, in fact, related to our food supplies and commerce. David also managed to engage non-scientists with a terrific discussion on open access publishing, peer review and science communication (Storify Part 3, 4). This was particularly relevant in a week when famous journal Science published what appears to be a sting article on Open Access publishing, one of the hottest current issues in science at the moment. Hosting a question and answer session on Everything You Wanted to Know About Sharks but Were Afraid To Ask, David not only shared his science stories, but shared the audience’s own experiences and stories with us all. It was a unique two-way interaction and engagement, the kind of thing we love about Real Scientists. And hopefully, we finally put Megalodon to rest! So thank you so much, David, for such a spectacular week. Perhaps we need a Shark Week every year at Real Scientists. Whaddaya reckon? We were delighted to have David host for us this week and you can continue following his amazing adventures at @WhySharksMatter or follow his writings at Southern Fried Science. The storifys are also available here.